Puccinellia distans.Robert W. Freckmann Herbarium.University of Wisconsin at Stevens Point.wisplants.uwsp.edu. (Accessed 5/2014). 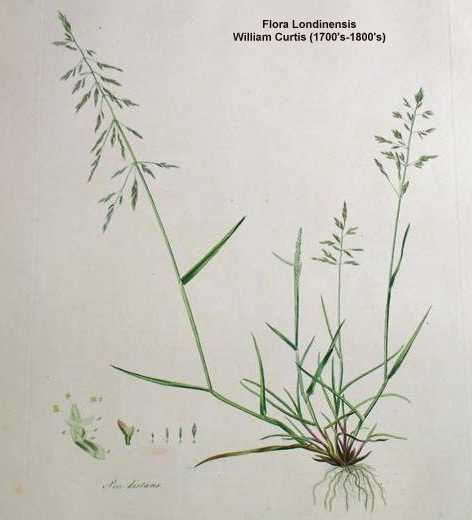 Puccinellia distans is a perennial or annual C3 grass (Waller and Lewis 1979), 10-50 cm tall, tufted, stems bent near base, leaf sheath open, ligule less than 0.2 cm. Leaves 3.5-10 cm long, 0.1-0.4 cm wide. Flower spikelets 0.3-0.5 cm, 3-7 flowers, very finely hairy, glumes 0.1-0.2 cm, glumes and lemmas with blunt, ragged tips; inflorescence 6-20 cm long, green, sometimes purple-tinged, branches raspy-textured, lower branches 3-13 cm long, wide spreading or bent downward, mostly flowering along the outer half; blooming and fruiting June-Oct. Frequency in NYC: Very infrequent in natural areas. Habitat: Open disturbed habitats in saline or alkaline soils, mostly roadsides. Sometimes in salt marshes. Notes: Found growing with black rush (Juncus gerardii ) in Lincoln Park, Jersey City, NJ.